Man City to win the league. Arsenal guaranteed top 4. Man Utd’s league season already finished. Palace to get relegated. Newcastle top half. Maybe, Maybe not. They say a league only tells the truth at the end of the season. We saw a glimpse of the reality behind this at the midway point in the current season, where the only change in the top 4 was Everton replacing Man Utd in the coveted Champions League positions, even though the talk for the first 15/16 games of the season was whether Liverpool could mount a challenge on the league title only to finish the halfway point in 5th and 6 points behind the leaders. Every fan has their own memories of their own personal experience of luck at the timing of playing teams, injuries, after a midweek game, whilst the opposition are on a good run, a bad run, the same applying for their team. Starting games with confidence has a huge effect on the outcome of results, but the simplicity is that all teams play each team home and away. At the start of each season each manager will identify where they are going to pick up points, and at the same time expectations are managed post games as to whether their teams have ‘dropped points’ or gained bonus unexpected points. Every week I overwrite the previous season’s results with the current season’s – for the corresponding fixtures. For example, Arsenal are generally touted as the ‘most improved team of the season so far’. That isn’t actually the case. Although they were top of the league at the halfway point and remain there as I write, they are in fact one point worse off than the same games last season. We all remember, I certainly do as a spurs fan, the incredible run that Arsenal went on towards the end of the season that has slightly skewed the figures, but it does show that they have now consistently been a good team for quite some time. The season finishing and restarting just fell at the wrong time as the last 12 months have definitely showed champion consistency and quality, just not in the same season...so far anyway. This also points towards the basis for this, in looking at the premier league table now and as a forecast for the final positions. If the results are as similar as last season, as has been the case so far, they could even find themselves outside of the top four. After 21 games, as mentioned above, Arsenal are one point worse off than the same games played last season. I mentioned I am a spurs fan, they are actually one point better off. Clearly though, Arsenal are entering the final 17 games of the season with confidence and with a very different pressure hanging over their shoulders. The games they struggled in last season are the games they have yet to play. I think a fair argument is that Man City are the best footballing team in the league at the moment and they have the strongest squad, they are though competing on four fronts. they are brutal in front of goal regardless of who the opposition is. The recent game at Newcastle goes to show though that they can get beat, they didn’t, a crazy refereeing decisions helped make sure they got all three points on the day, but they are not indestructible. Their start of season questionable away form appears to have been eradicated. They have already accumulated a staggering 16 points more than in the same games last season. Plus they have achieved this with a little more panache than last season, 28 goals more than the correlating games last season (see goals comparison in the table below). With the bookies end of season points tally spread for City currently set at 82.5-84 I would certainly be buying that, as they are on target for around 88 points. Inheriting last seasons results to complete the league forecast will result in them winning every home game. At home they only have Chelsea, of the so called ‘big teams’, to entertain at the Etihad and so that is not an unachievable target. Away from Manchester they inherit results from last season where they picked up only 14 points (from a possible 24) from the remaining 8 games they have left on the road. At the bottom of the league, the promoted teams within this system inherit the respective relegated team from last season - Cardiff assume Wigan’s results, Hull assume Reading’s and Palace assume QPR’s. This only really stands due to the team staying in the premier league retaining their results and so implying the result against the promoted teams. The games played against each other is the obvious draw back in this system. Of the promoted teams though interestingly, and at the same time worryingly for Cardiff and Palace, is that on a like for like comparison Cardiff have accumulated exactly the same amount of points as Wigan had over the same games last season and Palace are 1 point worse off - and that’s against a miserable return of only 25 points that QPR managed to get last season. It’s been quite obvious to see that Hull have certainly done themselves proud in the first half of the season and are well on their way to achieving the 40 points target. On that note I think it may be as low as a good goal difference on 36 points needed to stay in the division this season. Man Utd at the top end of the division finished the league 11 points better off than second placed City. This means that not only are they finding it tougher this season, but they are inheriting good points emphasising how many points they have dropped compared to last season. A staggering 13 points worse off than last season, by far the largest difference in points versus the previous season. They are though Man Utd, and despite what everyone says, they have the same players as last year and can still very easily go and beat any other team in the league. They are still on target for 76 points, a target that is still very achievable, as they have definitely turned the corner in my view. I think they are out of the title race, but by no means are out for the race for the top four. West Ham, which I am sure most of you would have noticed, have also been shedding points. They currently sit in the relegation zone having dropped 10 points versus the same games played last season. Aside from Man City’s increase in fortunes by the 10 points mentioned earlier, Southampton are 11 points better off, and Liverpool close behind with a better return to the tune of 9 points. Stats are stat, numbers are numbers, so long as the assumptions are clear and understood then anyone can interpret the numbers as they wish. For me though the main advantages are vs. the Spreads being offered by bookies as to the final points tally for each individual team. You may be surprised at how some of them read and below is a brief summary comment on each team and the spreads currently being offered as at 15th January 2014. This is by no means any solicitation to encourage anyone to place any bets, or to entice or act as advice in placing any bets, it is shown purely as food for thought based along the lines of the article and along side the fact that the league only tells the truth after all games have been completed. Current league position: Team Name: Forecast points using my assumptions: Spread being offered: Bet Signal (Buy/Sell/hold/Other, for other see the comment below). If the forecast points and the spread are to close and so no real difference ‘Hold’ will be the call. It is interesting how similar they are and so I only consider the real opportunities in the spreads offered as worth buying or selling. 1: Arsenal: 72: 79-80.5: Other. I would avoid betting on Arsenal either way. The bookies have them finishing 3rd but as to the points I think they will pick up more than the forecast indicated 72. They dropped points against Swansea, Fulham, Man City and Man Utd at home, whom they are yet to play and away from home dropped points against Stoke, Chelsea, Everton, Tottenham & Southampton. As you glance over the results some are realistic and will happen, I don’t think all will though and so feel a better return than the forecasted 72 points will be achieved, just not enough to want to buy or sell the spread either way from the bookie. As already spoken about I can see City smashing the 84 points being offered by the bookies. I think that if you held a gun to my head I would be buying the points as 81. At home only dropping points against Spurs and Man Utd to come, do not give a huge amount of room to deter from last season results to come. Away from home is a different kettle of fish. Of the games remaining they dropped points at Swansea, Palace (well QPR back then), Liverpool, City & West Brom, and I can’t see them dropping points for what would effectively be every other away game. They will drop points but not at the rate they did. The forecast inheriting all these dropped points is bang in the middle of the odds spread being offered and so I would consider a very prudent forecast and buy would be the spread as I think more probability they will pick up more than the forecasted points than they will drop them. They are a bit of a wild card this season, mainly because of the little genius from Uruguay. Love him or hate him, the guy is incredible. They are yet to host Chelsea, Arsenal, City and Spurs at home (probably shouldn’t include spurs as a possible threat after the 5-0 mauling at the lane a few weeks back). Of those teams they only got full points against spurs last season and so there is a lot of scope for their points tally to improve, coupled with getting beat by Villa at home. Liverpool do not have what would be considered as really tough games away from home apart from Man Utd, for which they are not ‘expected’ to get three points. I think the big difference in the second half of the season will come from the home wins against Man Utd and Man City, which I can’t see them getting full points from again. Away from home results I can see staying fairly consistent with last season, games to play away from home = 9, those games last season saw them win 1, lose 4 and draw 4. I promise this is unbiased. I think the home games will return a similar amount of points, Man City and Arsenal are yet to play at White Hart Lane from which Spurs got full points from last season, but also Fulham and Cardiff (Wigan last season) for which they lost both games. The two toughest away games they have are at Liverpool and Chelsea, they only gained 1 point from the same games last season so do not have a lot of points to replace. Their away from, of which I am about to curse, has so far been good. They will have a better second half of the season than they did the first. Sure in the second half of the season so far they dropped all three points at home against Spurs, but they did last season, so was in the numbers as an assumed result. My nephew won’t be happy as an avid Newcastle fan but the points spread offered is some way above where the forecast is plotting them. The games they have remaining didn’t yield a lot of points for them last year. The forecast has them getting less than a point per game for the rest of the season. I don’t think they will finish as low as 47 but would still be selling the points tally being offered. They are a little hit and miss again following the great start to the season. Injuries, suspensions and fatigue have set in. I don’t see a big indicator away from the spread being offered to call either way, and with the concerns at the club surrounding who will be in-charge tomorrow let alone at the end of the season, i would avoid placing any money on Southampton either way. Any team can turn up when you play Swansea, they can be world beaters on any given day. They are hit and miss though and with Europe about to kick off again with a two leg Napoli distraction I think the point’s tally spread is in line with the forecast. The forecast numbers using my assumptions have been skewed due to inheriting Reading’s results from last season, so I am avoiding this. I think they will stay up, they are spending money. All they need to do now is sort out the name debate and for what its worth I think the name should stay Hull City AFC. This is England, we are traditionalists, we do not have franchise football, and we don’t want it. Dr Allam, you have been great at Hull so far, leave it as Hull City AFC and concentrate your time, legal and marketing money on improving Hull City AFC and the local area. By all means give a name to something you have given birth to or created from nothing, but don’t change the name of a 110 year old club. The bookies have them finishing as the stats show. It is a shame really as I thought they had put in the hard graft last season and had turned the corner, that they were going to start pushing up the league a little with a little more consistency. They seem to have sizzled out a bit. They gave the Gooners a good run for their money the other night, but need a lot more consistency towards the back end of the season. A top half finish is in the sights of Stoke. A change of manager hasn’t really had a huge change in fortunes, but they are showing the fight they have had since joining the premier league. So silly dropped points at home are built into the numbers from last seasons home loss against West Ham, and as a comparison only picked up 10 points away from home from the 9 away games, of which most are against bottom half opposition and I think they will better that in the latter stages of this season. They were a good solid outfit last season and have already dropped an additional 10 points from the 21 same games last season. At home they seemed to beat the teams they shouldn’t and lose to the teams they should, well that’s how the forecast looks, I can see them getting 6 points at home against Liverpool and Chelsea, but at the same time can see them getting more points than the zero obtained at home against stoke, Cardiff and Fulham last season. There is not real indication either side from the spread set at the bookies so avoiding this one. They wont get relegated. I think they are too good. They just need the ‘senior’ player to stop acting like an impetuous 17 year old. You simply can’t have your leader getting sent off so needlessly. It could be a blessing in disguise as it will give others a chance, and watching the game at Cardiff they definitely showed a lot more togetherness than I have seen (away from White Hart Lane of course where they have had a great amount of joy from this season). To reach the 39 forecasted points they only need to better 4 points from the remaining 8 away games and 15 from the 27 points available from home games. They have five very winnable games to come at home, one they could possibly win and three I can’t see them getting anything from of which last season they gained 17 points. This included beating Arsenal though and so I think the 17 points is the top end of what they will achieve from the remaining games. Away from home they only picked up 5 points from the equivalent 24 points available last season. With Cardiff, Swansea, Villa, Fulham, West Ham & Southampton on the away day calendar equally hit and miss they could see them selves getting the forecast 42 points and more importantly safety. The remaining fixtures do contain three good results they achieved away from home last season, 3 points at Spurs, Swansea and West Brom. I don’t see them achieving three away wins again but there is certainly enough games in their favour to gain more than the suggested 17 points the bookies are suggesting are at the top end of what they can achieve in the remainder of the season. I don’t think the 44 forecast will be achieved in full but they won’t be far off. It’s been tough, especially when compared to their neighbours in Swansea. Whilst I have no doubt Ole has a good understanding of the Premier League they do not look like picking up more points than the 36 forecasted to make. Also considering the forecast contains away wins at Spurs, Southampton and West Brom I think the top end of the points Cardiff will achieve is already in the numbers. I hope the optimism of the club and the fans remain and that the forecast is wrong as I like having two teams of the county of Wales in the Premier League. If you haven’t been to Cardiff to watch sport go, it is home to, what I think is one of the greatest sporting venues, the millennium stadium and it is a great host city for most events. The numbers say to sell, but realistically they have inherited terrible results from QPR, albeit that they are worse off season on season than the results they were skewed by the terrible results early on in the season. Tony Pulis has already forced through a change in fortunes but I don’t think they have enough quality or confidence to gain more than another 19ish points I think will be needed to stay up. It is all well drawing but they need some wins to gain points, and prevent others from getting those points and converting the draws to wins is going to be tough. I think they will be on the cusp of relegation with 36 points. The forecast already includes them picking up 16 points from the 9 home games remaining, only 4 away from home though. They have some winnable games at home remaining that saw them drop points in last season, notably Swansea, Palace, Stoke, Southampton and West Brom, not winning any of the mentioned games. If they stay up it is going to have to be from home, away from home they have the hardest games to come: Arsenal, Newcastle, Man Utd, Chelsea, Liverpool, Spurs and Man City, only away at Norwich is a game Gus is planning on taking a lot from. The derby at St James' could be as crucial in the run in as it was last season. How it works, The Assumptions. We assume the previous season’s results as the starting point for the current season. We then overwrite the previous result with the current seasons result as the game is played. 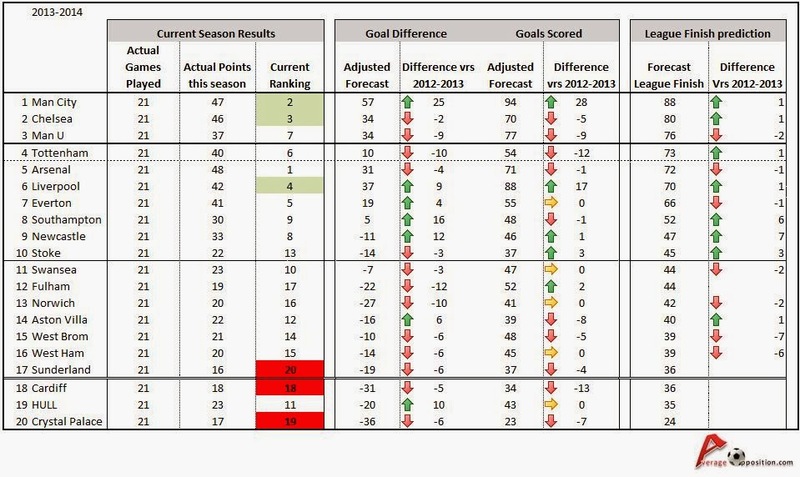 The league table is then adjusted to reflect the forecast finish for each team after 38 games. Each promoted team inherits the respective relegated team, for the season 2013/14 the changes are as follows. Agreed this is the largest assumption but one would estimate that the premier league teams should be stronger and so the results of the teams remaining in the division start with the previous results. Quite appropriately the promoted sides are the wildcards in the top division for the first season.